A bag of homemade spiced nuts may be the only treat you will need this holiday season. They are sweet, spicy, crunchy- all the elements you need in a great snack. Make a big batch of these spiced nuts and give them away as gifts. They would also be great served at your annual Christmas party. 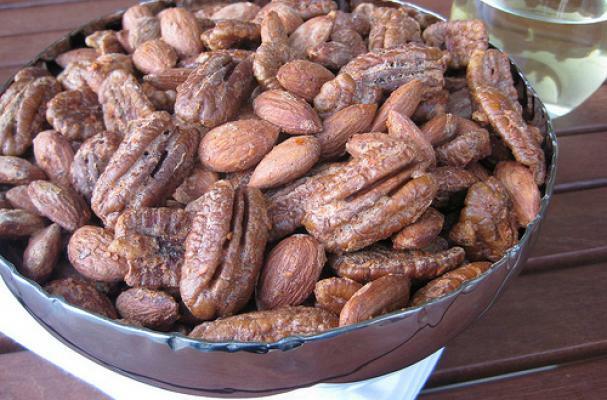 Whatever the circumstance, you must make a batch of these addicting holiday spiced nuts. Heat oven to 300 degrees. Beat egg white until soft and foamy. Combine all remaining ingredients except nuts; whisk into egg white. Stir in nuts until well coated; spread mixture in single layer onto an ungreased baking pan. Bake nuts for 15 minutes, then remove from oven. Using a metal spatula, toss, stir and separate nuts. Reduce oven temperature to 250 degrees and return nuts to bake until medium brown, about 10 minutes. Remove from oven; toss, and stir again. Place baking pan on wire rack to cool. Break up any nuts that stick together. Store in an airtight container up to two weeks. Oh! how 'more-ish' are these! Yummo!